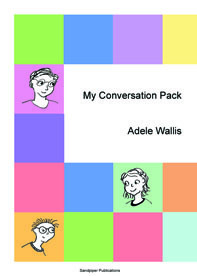 This resource contains everything you need to establish a conversation group. The materials are suitable for a wide range of ages, 8 - 18 years, and is even applicable to adult clients. There are directions for running a conversation language skills group, as well as suggestions for how to use the materials with individual clients. The resources have been written with flexibility and variety in mind. The Conversation Pack includes: A conversation mapping board to plot the flow and progression of the conversation through coding who says what, when; Topic cards - simple cards with topic suggestions from personal, school & work, and social / community / world issue fields; Conversation turn cards - five sets of five types of turn cards (e.g. ask a question, make a comment), clearly printed in different colours to represent the different players; Conversation sequence - a set of cards to highlight the stages of a conversation from beginning to end; Conversation notepad - for all your observations and notes for feedback to students at the end of the session; Instructions for use - instructions include general ideas behind working on conversation skills + specific strategies and rules for the Conversation Game, using the resources in a more structured group situation. Very applicable to groups of students with specific disorders such as Asperger’s Syndrome, intellectual impairment, specific language impairment, hearing impairment, etc.